One of the most electrifying two-way players Wyoming football has ever seen, Vic Washington was a great kick returner, defensive back and running back during the glory years of the late 1960′s. He finished his career as the school’s all-time punt returner. He also owned Wyoming’s career single-season (565 yards) and single-game (145 yards vs. Arizona State in 1967) punt return records. Washington led the nation in punt returns in 1966 as a junior with 443 yards on 34 returns. 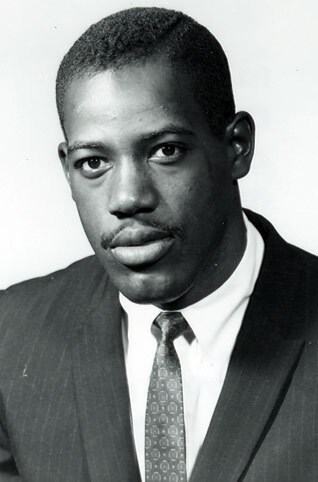 He was second in the nation in that category during his senior season of 1967. He returned three punts during his career for touchdowns, but one of his most memorable efforts was a kick return. He shocked a Provo, Utah, crowd with a 95-yard kickoff return in the ’66 championship game against Brigham Young, the fifth longest return in school history. Washington owned the total kick return record for a game (10) and for a career (103), as well as total kick return yardage for a game (178 yards) and for a career (1,404 yards). He was a three-time All-Western Athletic Conference first-team performer. He was one of just two sophomores to make the team in 1966. He led the WAC in punt returns during both his junior and senior years. He also was a running back for the Cowboys, and an outstanding cornerback on defense. As a senior in 1967, he led the team in interceptions. He produced a long career in the National Football League, playing for San Francisco, Houston and Buffalo.